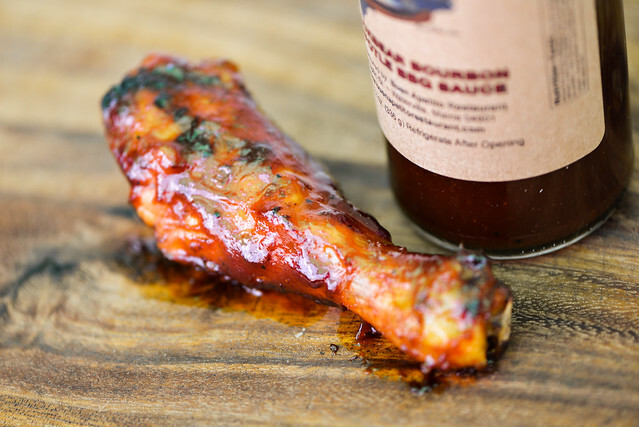 Delivering on every note of a robust barbecue sauce—fruity, sweet, spicy, smoky, and tangy—in a balanced fashion, this sauce is built to impress without over doing it in any one area. I saw this Deer Camp sauce sitting on the shelf of my local Whole Foods and bought it on a whim. I knew nothing about this sauce, but after a little research, found that its origins are not rooted so much in barbecue, but Mexican cuisine. This sauce comes out of Buen Apetito, a Mexican joint run by Gary LaPlante in Waterville, Maine. LaPlante's place has a bit of a reputation for their array of hot sauces, and in the last couple years they have begun bottling those sauces and putting them up for sale under the moniker Deer Camp. In total the line numbers eight sauces—five hot sauce, two barbecue sauces, and one wing sauce. One smell and there's no doubt of the chipotle in this sauce. Its aroma is strongly smoky and earthy, with a heavy spice that burns the nose—a tell tale signs of chipotle peppers. Vinegar mixes in pretty equally with the chipotle, furthering the nose singeing sensation. Sweetness is second in line, having a molasses depth that's easily distinguishable. Tomatoes take a back seat in the aroma department, falling in line with the more minute players like Worcestershire and garlic. 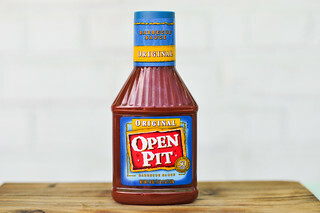 This sauce has an earthy maroon color that's semi-transparent with glossy sheen. There are lots of spices seen throughout, including distinctive black and red pepper. It weighs in on the thin side of medium and has a constant thin drizzle off of a suspended spoon. 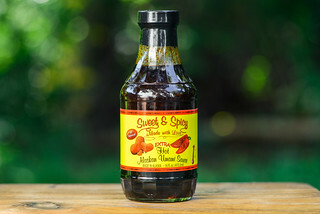 Once the pour has ceased, the spoon is left with a thin, transparent coating that clearly shows the large array of spices peppered throughout the sauce. Surprisingly, despite the weighty hot chipotle aroma, this sauce starts off tasting incredibly sweet. It's a mixture of sugar, molasses, and honey that finds all three sweeteners playing nicely off each other. It takes longer than I'd expect for the tides to turn, and vinegar is the second flavor out of the gate, backing the sweetness off with a bit of tartness. There's then a brief moment where a barrage of flavors add depth, including bourbon, tomato, garlic, and Worcestershire. Finally heat makes a gradual appearance, and as the sauce sits on the tongue, that spiciness begins to dominate everything else. At first the heat has hints of black and red pepper, but then goes full on chipotle, finishing with a smoky burn that leaves the tongue and back of the throat on fire. The sauce coated the chicken quite well, baking in nicely over indirect heat, and caramelizing a bit over direct. The flavor was incredibly robust and balanced, without being overwhelming. Like most sauces, the sweetness was slightly punched up after being grilled, and the spiciness backed down. All the layers of flavor seemed to work together at the same time, rather than be progressive, creating a chicken leg that was sweet, tangy, smoky, and spice all at once. I love happy surprise sauces like this one. 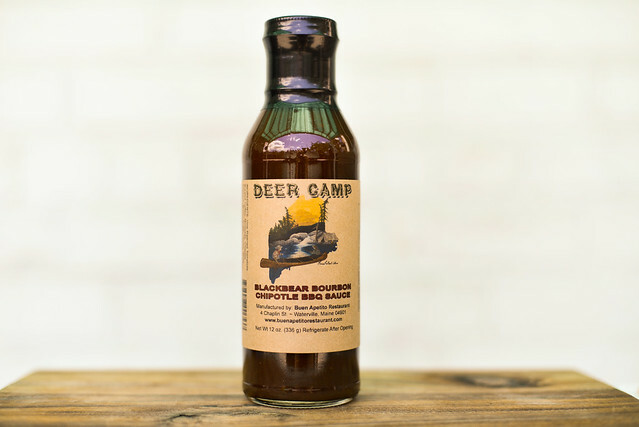 I picked up Deer Camp Blackbear Bourbon Chipotle purely by chance, with no preconceptions or idea of what to expect, and was rewarded with one of the finer sauces I've tested. A good barbecue sauce builds layers of flavor, and Deer Camp does that with great success. 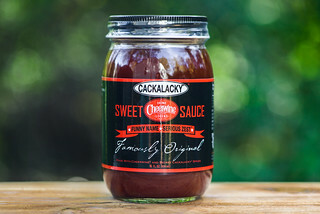 It delivers on every note of a robust barbecue sauce—fruity, sweet, spicy, smoky, and tangy—and each of those layers has its own depth too, furthering the complexity of the sauce. 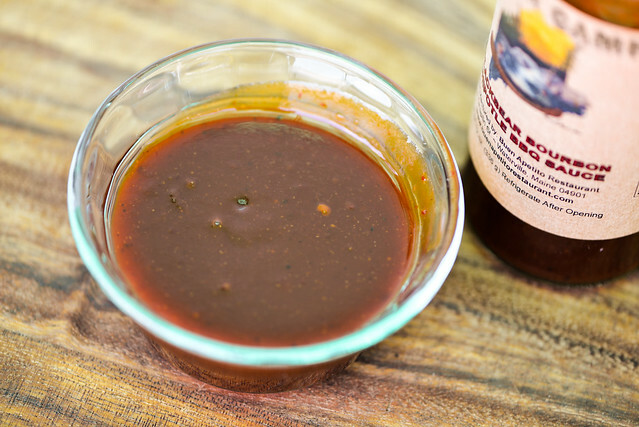 It did wonders for the chicken, and I wouldn't hesitate to slather this sauce on just about anything I was grilling. The only caution I'd put out there is if you're not a fan of spicy, this sauce may be slightly over the edge for you heat wise, but I'd still push you to give it try. This has absolutely nothing to do with the above sauce (which looks great and I'm gonna try to replicate it at home), but I gotta ask, could I request a Schweinshaxe recipe? I am gonna try to serve them for my Oktoberfest party and figured you'd be a pretty good resource. Cheers! And congrats on the Brethren comp wins. Sounds like one I would like but my family would hate. I like spicy, they like sweet....Blues Hog sweet. @Phil in France Never heard of Schweinshaxe before, but I'll look into it. It may be hard to make a proper recipe without have tried the real thing. Watch out for the schnapps.